PappaRich is all about serving delicious Malaysian food. According to their website, the name PappaRich hails from a book ‘Rich Dad Poor Dad’ by Robert Kiyosaki about a highly educated man ending up fiscally poor (Robert’s father), and another (Robert’s best friend’s father) – a high school dropout who became a self-made multimillionaire. Starting in Malaysia in 2005, PappaRich seems set to take over the world with already over 100 outlets including many in Malaysia, Australia, Singapore, Brunei, Shanghai and Los Angeles, and there are plans in place for Indonesia, New Zealand, Macau, UK and Saudi Arabia. It’s a simple vision – To Bring Malaysian Delights to the World. So far, they seem like they’re well on the way. They pride themselves on the authenticity of their food and claim to use traditional recipes that have been passed down through the generations. They then adapt them slightly for the various countries where required (e.g. spiciness, sweetness). So, what can you expect to find at PappaRich? Traditional Malaysian favourites including freshly made roti canai, Hainan bread, satay, nasi lemak, fried kuey teow, mee goreng, laksa, chicken rice, dumplings, ice kacang and lots more. And, vegetarians rejoice – there’s a whole section on the menu including vegetarian dim sum options and rice and noodle dishes that can include mock meats. The fit out in Gouger Street, where Café Kowloon used to be, is bright, spacious and clean with subdued tones. All of the wait staff are smiley and super friendly. The menu books are colourful with photos of the dishes, so it’s easy to choose. Everything on the menu has a unique number and on your table you have ordering sheets and pencils. When you’re ready, you simply write down your order numbers and quantities on the sheet and – here’s what’s a little different – you have a button that you press when you’re ready and one of the wait staff comes and collects your piece of paper. Simple and efficient (and a bit of fun). 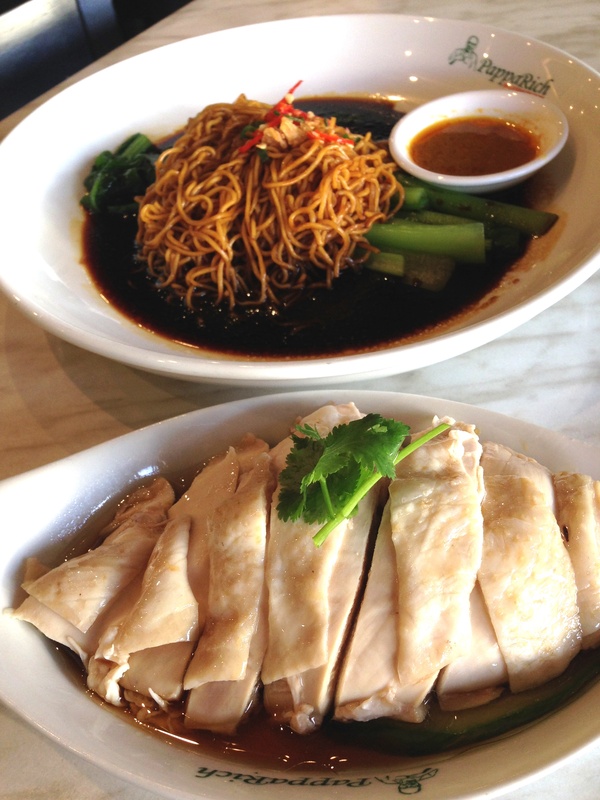 The Dried Curry Egg Noodles with Steamed Chicken not only looks great, it tastes great. There was plenty of juicy chicken and I loved the noodles – a good combo. I will certainly be going back to have this again! The Pappa Wat Tan Hor Combination Noodles didn’t arrive looking quite like the photo, but it didn’t matter – they were tasty and perfect for the cold day that it was. They came with some pickled green chilli but when I asked for some hot chilli sauce, I was told they only have sweet chilli sauce, which is a bit of a shame. My dining partner on my first visit had the Roti Canai – Roti Teur Bawang with Curry Chicken. She loved it, and I’ve been told by a ‘real Asian’ foodie (i.e. an Asian that was born in Asia and not in Tasmania), that PappaRich is the place to go for Roti Canai – it’s both authentic and excellent. The Vegetarian Fried Mee Hoon with Curry Mutton and Eggs was a generous serve and really good. A large pile of thin rice noodles served with mock curried mutton which I really liked, and served with a sambal that was nicely sweet but still had that kick of heat to it. I’ve also tried some of the dim sum options – the Vegetarian Fu Chook, the Prawn Dumplings and the Vegetarian Shui Kau Dumplings. They’ve all been enjoyable. The down-sides: Firstly, there’s no alcohol so you can’t enjoy a beer or a wine with your meal. Secondly, they won’t let me swap thick noodles in a particular dish for thin (I have an odd aversion to thick noodles). And thirdly, they won’t allow you to pay for the bill with more than one credit card (e.g. going halves with someone) – but these are pretty small things. I still want to go back and try everything – but at the same time I want to go back and have the same things – oh the dilemma! Anyway, I’m sure PappaRich will be a huge success here in Adelaide. It’s great food, a nice environment and pretty cheap.